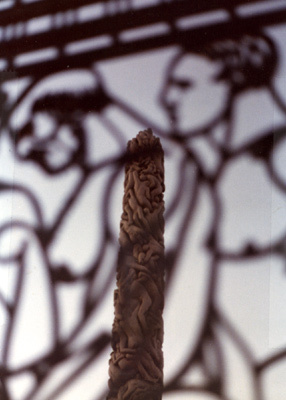 Vigeland is almost unknown outside of his native Norway, but he's much loved there  especially in Oslo, where he cut a deal with the local government to provide him with living and studio space, in return for which he agreed to turn over much of the work he produced to the city. The result is the Vigeland Sculpture Park, in the heart of the city, which I visited in 1976, and which you can read about here. The obelisk in the photo is at the center of the park, and Vigeland also designed the iron gate in the foreground. Oslo is not the most interesting of cities, but the Vigeland Park, the Munch Museum, and the Viking Ships Museum combine to make it well worth a visit.